After a draw down at Cambridge, United now had to negotiate a replay. Surely home advantage could be made to count to see United through to a fifth round tie at either Sheffield United or Preston North End and so it did with a straightforward win. The thing about replays is that you have to do something a little different to pose a new set of problems for the opposition. In this game the difference was width and a physical presence in the Cambridge box. Employing a 4-4-2 diamond again United looked secure at the back albeit against lower league opposition and despite an early let off when Blind uncharacteristically gave the ball away in his own half. With Blind playing in front of the back four, United looked fairly solid at the back. Smalling and Evans coped well with Cambridge’s big physical forwards. 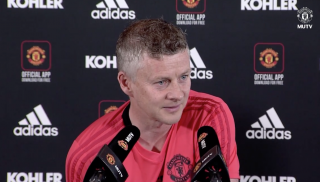 Van Gaal chose McNair and Rojo as his full backs; did he chose these two big players ahead of his more usual fullback chooses anticipating a physical challenge from the opponents? All four across the back played well and hardly ever gave the ball away, (Jonny Evans recorded a remarkable 100% pass completion rate!). United used the width of the pitch to control possession and as such the game. They constantly switched play in a deliberate attempt to run the legs off the opposition on the big United pitch. 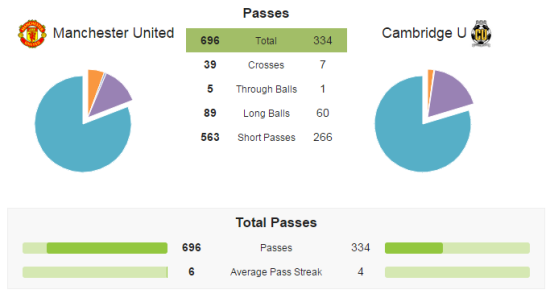 It worked as Cambridge visibly tired from as early as the end of the first half. Di Maria and Rooney were positioned as the outside midfield players in the diamond. 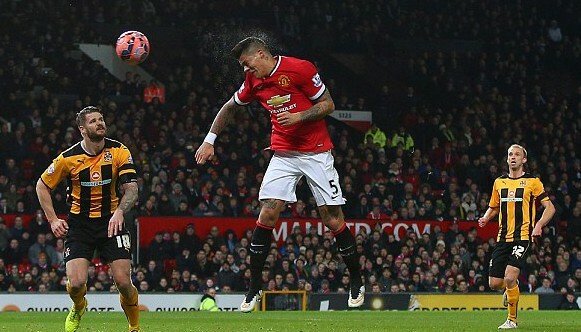 This meant that di Maria was noticeably deeper than in the weekend’s fixture against Leicester. As a consequence his play was less adventurous than usual but his disciplined performance saw his pass completion rate rise from 69% to 80%. These two players are perhaps the best at switching play and moving the ball quickly and accurately from one side to another. 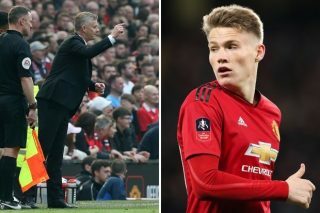 The two full backs Rojo and McNair played quite high, usually within a few yards of the touchline in the first half and this ensured that United were able to prod and probe at the visitors defensive shape across the maximum width of the pitch. They are not necessarily the most confident crossers of a ball however and all too often then tended to recycle possession inside to either Rooney or di Maria who would then switch play. 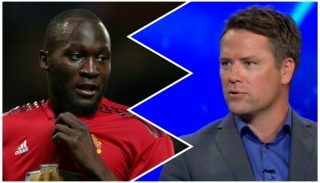 They rarely looked to run past the opposition’s fullback but United’s use of width meant that the team delivered 39 crosses in total and that without a team shape which utilized conventional wingers. Rojo was perhaps the more adventurous of the two, but not by much. If van Gaal chose his defenders to ensure a physical presence he did the same in attack, Okay Mata maybe a diminutive number 10, but ahead of him he selected van Persie and Fellaini. Fellaini was almost certainly chosen for his robust nuisance value. He had a hand in the opening goal but crucially provided another option to United’s passing game. Playing as a forward he always made himself available as a target and regularly changed the angle of the attack then the ball was played into him. 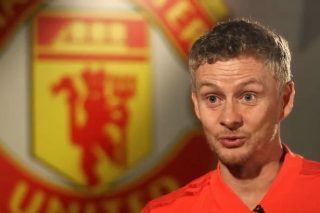 His presence meant that Cambridge always had to be conscious of the possibility of a quicker ball played forward and this was a key difference from the threat United posed in the first game. Van Persie struggled in this game as he has done in many of late. For long periods he wasn’t really in the game but he did have a number of good chances, a couple at the end of the first half and four in the second half before being replaced by Wilson after 65 minutes. 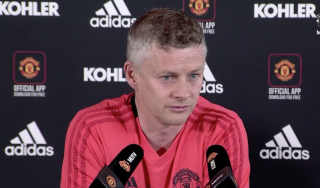 The feeling persists that he has lost something from his game and he could be seen on several occasions imploring his teammates to work the ball forward to him more quickly. Does his current game suite United patient possession based methods? 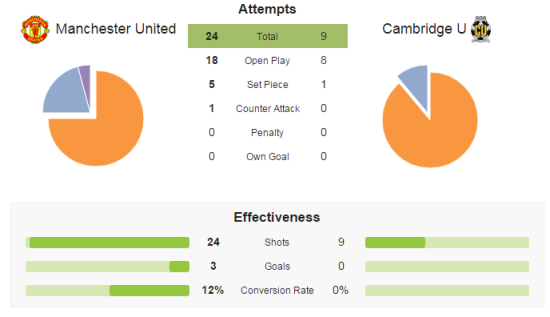 United could have scored more goals in this match as Cambridge visibly tired; they had 24 shots but only 9 on target, which suggests at least one area where there is room for improvement. This was an easy win in the end for United. 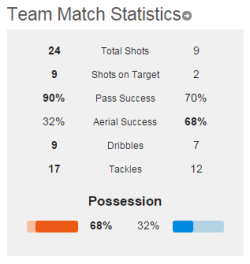 They scored three but could have scored more with greater accuracy in front of goal. The strategy of moving the ball across the pitch, switching play and making Cambridge run on the big pitch at Old Trafford worked. Towards the end of the first half Cambridge looked tired. We should give credit to the visitors though for maintaining their shape, (a 4-4-1-1), and their discipline. They didn’t fold as they may have done having conceded two goals in quick succession in the middle of the first half.